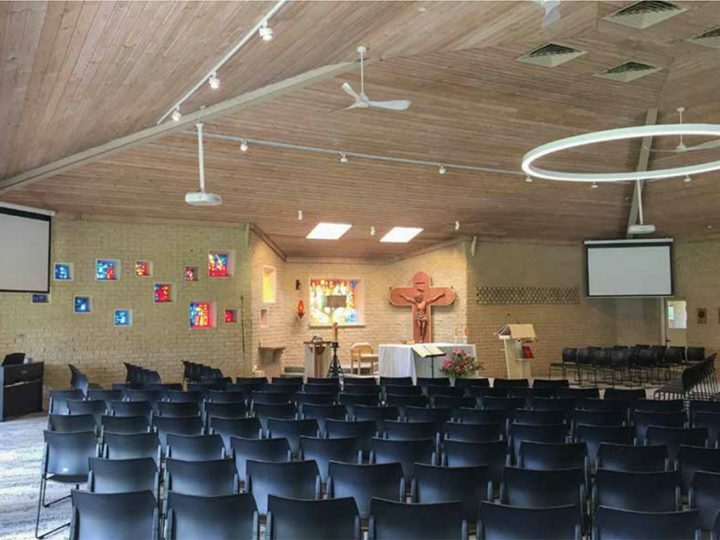 Located in the Melbourne suburb of Burwood, St Benedict’s Church is a Catholic parish with an active congregation. With a mass at 9:00AM each week day and four services on weekends, there’s never a dull moment on the premises. The church has a beautiful auditorium and modern facilities combined with a friendly, welcoming environment. 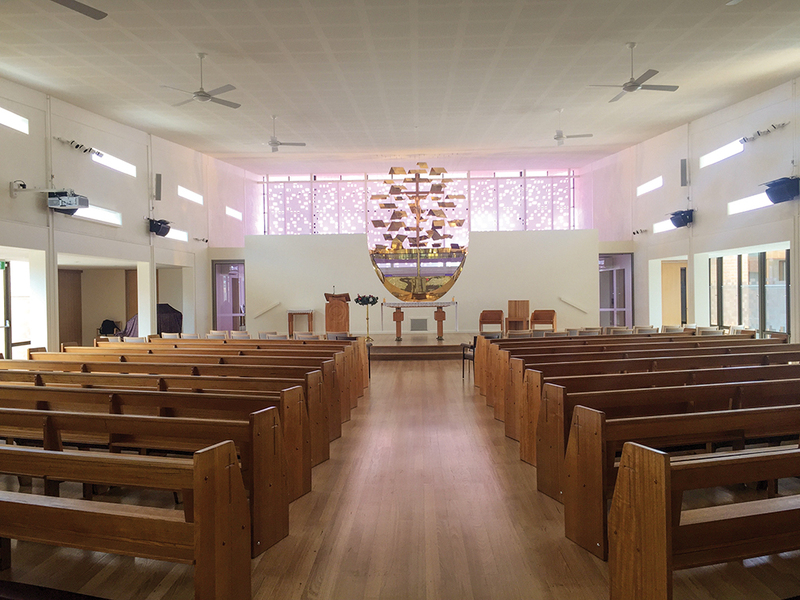 St Benedict’s chose to embark on a radical overhaul of its main auditorium, on both architectural and technological fronts. Part of this process included the installation of a new PA system that would serve the various groups who regularly utilise the space. 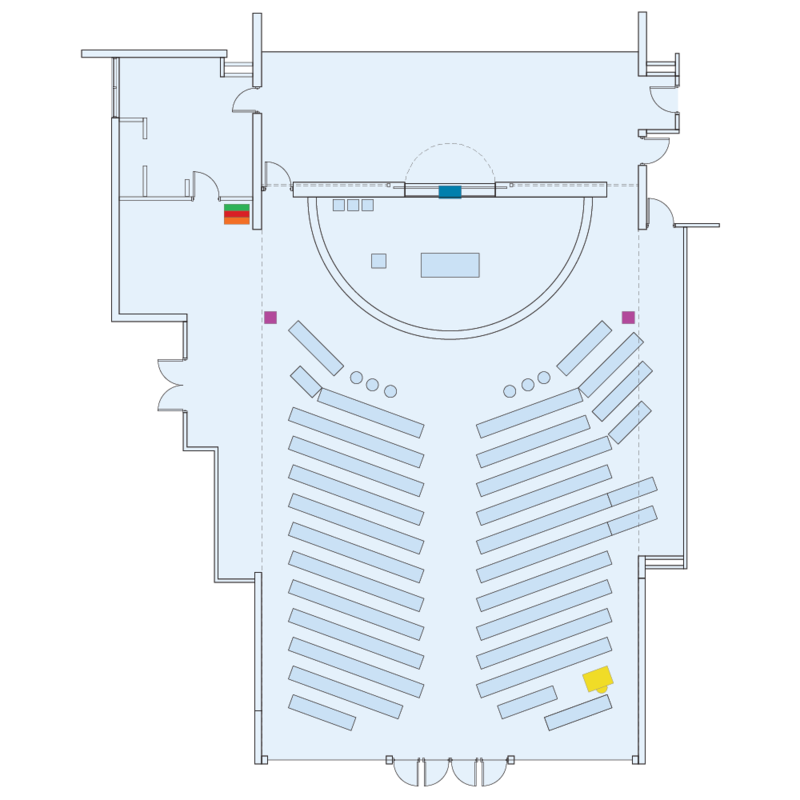 The seating layout and altar orientation were completely redesigned. Design changes included the addition of more hard surfaces such as timber floors, sloped plaster ceilings, and the addition of glass windows — all of which posed challenges with acoustics. Apart from architectural changes, the biggest hurdle was the requirement for a multi-function audio system for the music ministry. St Benedict’s hosts many services, several of which have different instrumental groups varying from a full band ensemble to a single organist. The system needed to be simple enough for novice users to operate, yet flexible enough to provide implementation of a 32-channel mixing desk for when higher I/O counts were required. Yet another constraint was the restricted budget that forced the re-use of the church’s existing analogue mixing desk. Carl Pellegrino from Reflections AV approached NAS to design a solution that would satisfy St Benedict’s brief. Due to the requirement to keep speakers discreet and mounted in the room corners, Doug Pringle from the NAS Projects Team recommended the d&b audiotechnik xC-Series 16C column loudspeakers as main front-of-house. The 16C’s cardioid dispersion pattern produces 18dB broadband attenuation behind the loudspeaker, reducing reflections and resulting in balanced level distribution — perfect to combat the reflective surfaces in the auditorium. Not only that, xC’s slim form factor made for an inconspicuous solution that didn’t detract from the natural aesthetics of the church building and decor. Wiring them up was as simple as running a single cable from the d&b 10D amplifier to each speaker. A d&b 12S subwoofer was mounted behind the altar to provide low end extension, particularly useful in full-band scenarios. Most masses have a small input list, typically comprised of an organ, handheld microphone, and a microphone for the priest. In such cases, the Ashly FR-8 network remote was installed to provide volume control. The beauty of this setup is its simplicity. With very little training, even a novice can easily manage levels with the FR-8. However, when the full music ministry ensemble is playing, the Ashly ne24.24M DSP matrix processor allows immediate connection to the church’s resident 32-channel mixing console, instantly catering for a much larger input list without having to run extra cables or rewire the PA. It also maintains optimal tuned sound regardless of whether the inputs are mixed through the 32-channel desk or the Ashly FR-8. In houses of worship, a well-executed audio system should go unnoticed. The new installation at St Benedict’s does exactly that. 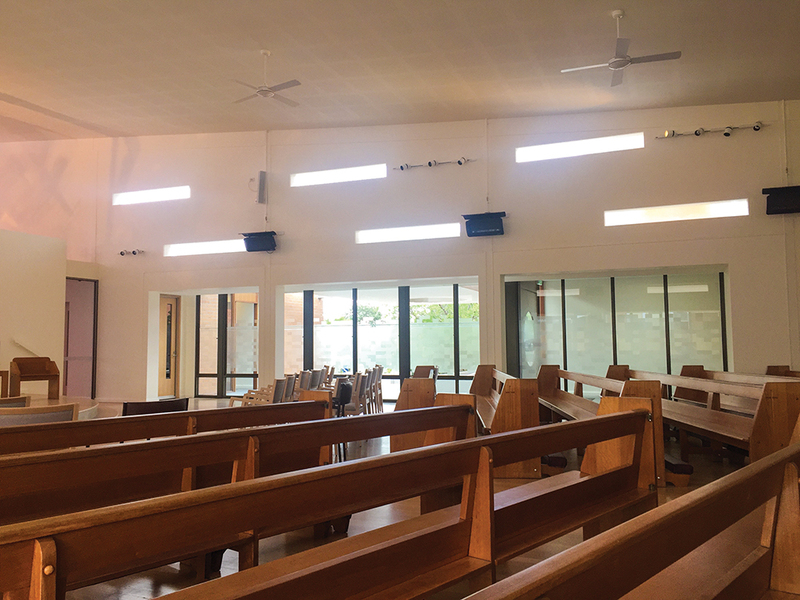 The discreet solution provides a significant improvement in sonics and intelligibility, while keeping the focus on the content of the church’s services. 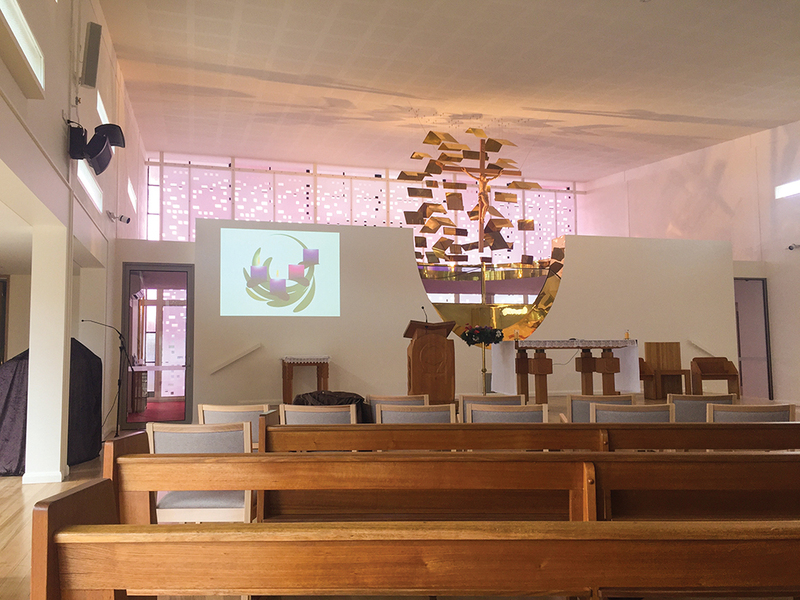 But the final result at St Benedict’s includes more than just high-definition sound reinforcement. It offers the church an audio system that seamlessly accommodates anything from one or two channels right up to 32, and is operable by novices and professionals alike. The church is very pleased with the outcome.